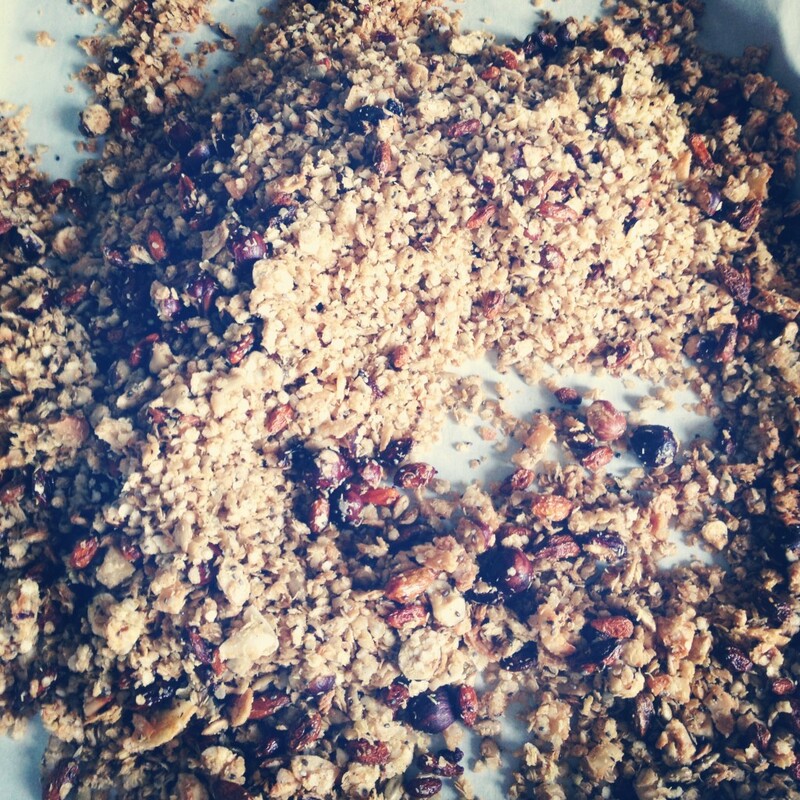 I absolutely love Granola and it has definitely become one of my specialties. Lots of people buy granola at a grocery store, or get some from their local coffee shop thinking they are indulging in a super healthy treat. I am sorry to be the bearer of bad news, but most granolas are loaded with refined sugars and unhealthy fats. While oats and nuts provide protein, healthy fats and whole grains when you load them with hydrogenated oils, brown sugar, syrups etc… you might as well have a piece of cake. What frustrates me about this is that you can have granola that is healthy and tastes just as good, if not better than that bagged junk you get at the grocery store. This recipe is SO easy and so delicious! It is gluten-free, dairy free and refined sugar free. It is filled with super foods to give extra omega 3, fibre and protein. I enjoy it on coconut yogurt, with unsweetened almond milk or sprinkled on overnight oats. Have a wonderful day and enjoy! 2. Whisk together the olive oil, coconut oil, cinnamon, vanilla, chia and maple syrup in a large mixing bowl and add the quinoa flakes, stirring to combine thoroughly. If your nuts and coconut flakes are raw (not roasted) add these too. 4. Roast, stirring now and then, until the flakes are dried and crunchy and a lovely golden brown, about 25 minutes. 5. Let the quinoa mixture cool completely before mixing with the remaining ingredients. Store in a glass jar for up to 2 weeks. Enjoy!